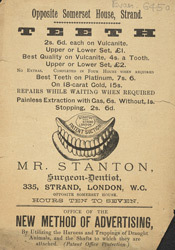 For both reputable dentist and charlatan the main profits came from the sale of false teeth - prominently advertised and illustrated here by the surgeon dentist Mr Stanton. By the end of the 19th century dentures made of vulcanised rubber offered a cheaper alternative to those made of platinum or gold. Vulcanite dentures could be moulded and coloured to match the natural gum and when fitted with porcelain teeth might improve mastication and articulation and restore a natural appearance. Patients might also benefit from the use of nitrous oxide gas as an anaesthetic for extractions.